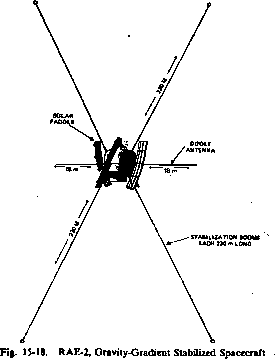 Note that in the example shown, slit A is nominally parallel to the spacecraft X-Y plane and the spacecraft Z-axis is in the sensor Y-Z plane. A further useful simplification results if the reticle geometry is chosen such that 180m/c/(7tA)= 1. In this case, BazN where B is now expressed in degrees. from which the azimuth and elevation of the Sun in spacecraft coordinates may be computed. NA and NB are unsigned decimal equivalents of the m-bit Gray-coded sensor output and km is a sensor constant. (See Table 7-2 for representative values of the sensor constants.) The form of Eq. (7-17), particularly the addition of 0.5 to NA and NB, is a consequence of the Adcole alignment and calibration procedure.